Easily Transfer Music/Video from iPod/iPad/iPhone to iPad 2 or from iPad 2 to Mac/ PC/ iPhone/iPod/iPad. 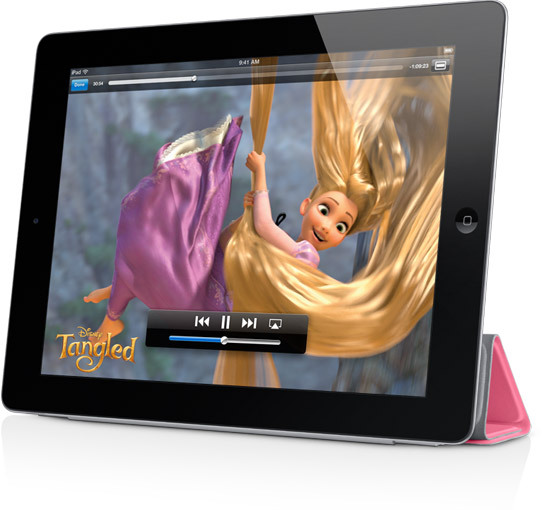 With the debut of iPad 2 in the Apple market, there are a flood of discussions about pros and cons of Apple iPad 2. Some consider the second generation of iPad to be much thinner, lighter, faster and more powerful than the first generation; while others consider iPad 2 is just the same as iPad. There is no doubt the iPad 2 will be a greater one. But is it worthy to upgrade for the current iPad users? If choose upgrade, the first problem they would meet is how to transfer songs/movies from current iPad to iPad 2 or iPhone to iPad 2, or iPod to iPad 2. As for new Apple users, if they decide to buy the newly iPad 2, they still will meet some inconvenience. For Apple only allows transferring files from iTunes or computer to iPad 2, but it blocks the transfer from iPad 2 to Mac or PC. 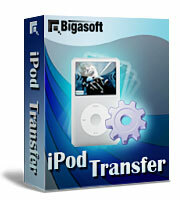 In fact, there is no need to worry the above problem as long as you own Bigasoft iPad 2 Transfer - Bigasoft iPod Transfer. With it, you can easily transfer music/video/playlist from iPhone/iPod/iPad to iPad 2 or from iPad 2 to PC/Mac (including Mac Lion)/iPhone/iPod. You can even transfer music/video/playlist from iPad 2 to the new iPad 4, iPad mini or iPad 3 or from iPad 3/iPad mini/iPad 4/iPad Air to iPad 2/PC/Mac/iPhone/iPod whatever them belongs to the same Apple account or different Apple accounts. 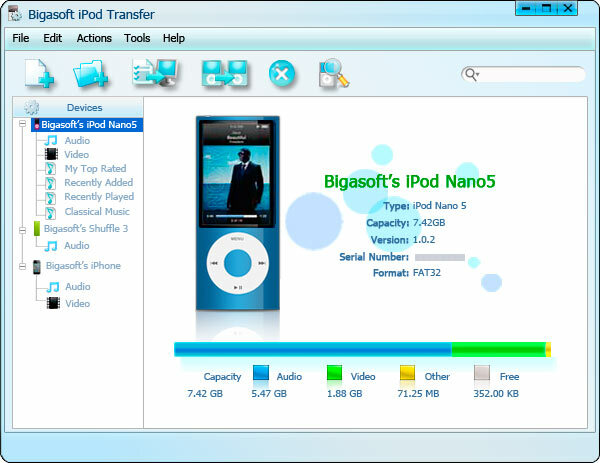 Free Download the professional Bigasoft iPad 2 Transfer - Bigasoft iPod Transfer (Windows Version, Mac Version), install and run it. Connect iPad 2 to your computer through USB cable, and then the transfer software will automatically load your iPad 2 into it. The interface of the transfer software will show you the type, capacity, version and other information of your iPad 2 just as it load iPod below. Or you can directly drag and drop audio to "Audio" folder, drag and drop videos to "Video" folder, and then check the file(s) you want to transfer in the file folder list. Click "Export to Local" button to choose the target folder for saving iPad 2 files on PC, and then click "OK" button to begin transfer files from iPad 2 to Mac or PC. There is no need to worry how to transfer music/video from iPad2 to OS X Lion, iPad 2 to Mac, iPad 2 to PC, iPad 2 to iPhone, iPad 2 to iPod, iPad 2 to iPad or from iPod to iPad 2, iPad to iPad 2, iPhone to iPad 2 as soon as you follow the above guide.